In September of 1683, Michel Sidrac Dugué captain of the Carignan-Sallières regiment and commander of Ville-Marie received a grant of large tracts of land as a token of the French Crown’s gratitude for loyal military services. In fact, Louis XIV entrusted Dugué, a valorous and courageous soldier in his eyes, with the colonization of the Mille-Îles Seigneury. However, after Dugué’s death in 1688, no further colonization efforts were made. It would seem that Dugué had been a better soldier than colonizing lord. Sidrac Dugué had married Marie Moyen who gave birth to seven children. Their three sons, however, preferred a military career, while two of their daughters embraced religious life. Their other two daughters, Marie-Charlotte-Élisabeth and Marie-Thérèse, married Jean Petit and Charles-Gaspard Piot de Langloiserie respectively. In 1714, the lands were returned to the French Crown, as the Seigneury had not been further developed. Excerpts from the Town of Rosemère’s commemorative 35th anniversary brochure "Rosemère – Yesterday and Today" written by France Lapierre and Jack Rice and published in 1983 by the Town of Rosemère’s Community Services Department. In 1714, the French Crown once more granted the privilege to run the Mille-Îles Seigneury to one of its subjects whose mission was to colonize the region. Thus, Jean Petit and Charles-Gaspard Piot de Langloiserie, the husbands of Marie-Charlotte-élisabeth and Marie Thérèse—the two daughters of Sidrac Dugué—became the new overseers of the Seigneury. Charles-Gaspard Piot de Langloiserie died in 1715, and Marie-Thérèse de Langloiserie, his widow, was left with a great number of young children and the responsibility of supervising Sainte-Thérèse Island as well as the Mille-Îles Seigneury. Marie-Thérèse de Langloiserie lived in Montréal where she also brought up her children. In 1730, the first colonists, the Charbonneau family and their companions, were led by her to the Mille-Îles Seigneury. These were the beginnings of the colonization of the Seigneury and its growth in population. Marie-Thérèse de Langloiserie died in 1744. One of her daughters, Suzanne Piot de Langloiserie (1700-1769), married Jean-Baptiste Céloron De Blainville and took over the task of colonizing the Mille-Îles Seigneury from her mother. Between 1745 and 1755, Suzanne De Blainville was personally taking care of all the land grants. Later, in 1755, she decided to get the help of Joseph Filion of Terrebonne who, together with her, administered the lands until her death in 1769. After Suzanne De Blainville’s death, large tracts of the Seigneury’s land were cultivated, extending from Grande-Côte Road and Dog River to the Cachée River, including the north shore, the south shore, and the Bas-de-Sainte-Thérèse. Suzanne and Jean-Baptiste Céloron De Blainville had one son, Louis, and three daughters, Marie-Anne Thérèse, Marie-Hypolite and Louise-Suzanne. Marie-Anne Thérèse (1731-1806) married Sir La Marque; and Marie-Hypolite (1735-1810), Sir Hertel. As of 1769, the year her mother died, Marie-Thérèse —better known as Thérèse De Blainville— was personally in charge of the Mille-Îles Seigneury. Most legal documents bear Thérèse De Blainville’s signature. She died in 1806, leaving behind a well-developed and established Seigneury. Her sister, Marie-Hypolite, only came back to the Seigneury in 1780. She took up residence in the Hertel Manor where she stayed until her death in 1810. The Hertel Manor stood near Philippe Street, at the intersection of Grande-Côte Road and the Canadian Pacific Railway. Sir Hertel, the last colonizing lord of the Mille-Îles Seigneury, died in 1817. At that time, the Mille-Îles Seigneury was called the De Blainville Seigneury. The part of the De Blainville Seigneury, which would later become Rosemère was transferred to William Clauss, the attorney general of Upper Canada. After his death in 1826, three attorneys, John Oldham, John Hettrick and David Morris (1823-1909) took turns administering the Seigneury. In 1837, the Rebellion led by the French Patriots against the British broke out. The Patriots of Saint-Eustache set Porteous Bridge (predecessor of Marius Dufresne Bridge at Bélair Island) on fire with the intent to slow down General Colborne and his troops. An English garrison had even stationed itself in Overing House—also called Twin Chimneys—located on Grande-Côte Road. In 1861, David Morris, the attorney of the Clauss family, bought the family’s succession rights and became Sir Morris to the locals. In 1880, J.P. Withers, a Canadian Pacific Railway officer, set up home in Rosemère. Impressed by the compelling charm of the many wild-growing roses, he decided to call the place "Rose," to which he simply added the suffix "mere," an old Anglo-Saxon word for swamp. He then went to Ottawa to register the name in use ever since. In the early 20th century, the region—now known under the name Rosemère—owed its growth to the presence of the Canadian Pacific Railway. In 1901, Rosemère opened the doors of its first post office, and in 1936, the area’s newly built chapel was inaugurated. What followed are chapters in Rosemère’s history well known to many of our older residents. Among events that come to mind are the regattas on the Mille-Îles River (formerly called Jesus River), pitting the Garths against the Tylees. Later, the Skeltons, the Earls and the Blachfords took up summer residence in Rosemère, and the Gilmours managed Thorncliffe House, a fine and well-known restaurant that burned down in 1982. Rosemère’s Country Club was founded in 1920 and its Golf Club two years later, in 1922. At the time of the Second World War, Rosemère was already a flourishing community. 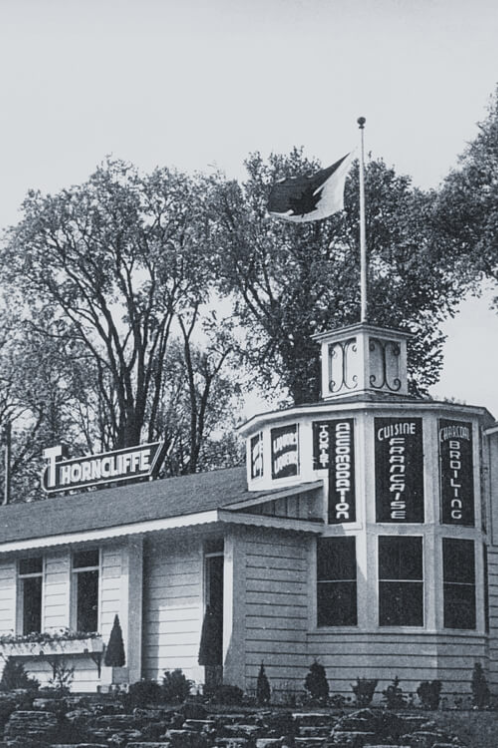 Rosemère was home to a Red Cross branch office, and a citizens association was founded with the aim of obtaining better services from the Town of Sainte-Thérèse. Rosemère did not yet exist as an independent town, as it was still under the jurisdiction of the municipality of Sainte-Thérèse. Services such as snow removal and spraying of the swamps were not up to par. To remedy this situation, the new Rosemère Citizens Association asked for the right to create their own parish. At that time, Carolyn Owens, who later became a municipal council member, had aleady been an active member of the Association. On January 1, 1947, the residents of Rosemère won their case and the Parish of Rosemère separated from the Parish of Sainte-Thérèse (founded in 1845). Rosemère’s first City Council comprised six councillors—Alphonse Couture, Hector Labelle, Hubert Maisonneuve, Ernest Gilmour, André Robitaille and Jack MacDonald—and was headed by the mayor, Raymond Perrault. The same year, a fire completely destroyed one of the homes in Rosemère, leaving the homeowners in utter destitution. Berthe-Yvonne Clément, called Beppy, an active participant in community life and welfare, collected money and clothing for the stricken family. Her humanitarian gesture was welcomed by all, and, as a result, a welfare service was called into existence. Hector Labelle was another resident actively involved in various community projects. A profoundly religious man, it is thanks to his efforts that a priest from Sainte-Thérèse would come to celebrate mass for the Catholic community during the summer months. The Sainte-Françoise-Cabrini Parish was established September 4, 1947. Over the years, a number of other groups and associations emerged, such as the Boy Scouts, the Brownies, l’Atelier de théâtre, the Horticultural Society, and many more. Rosemère continued to grow and was soon expanding beyond the boundaries of a simple parish. In the late 50s, Mayor H.J. Hemens wanted to approach the provincial government to apply for municipal status, without having to forfeit government parish grants. A council meeting was held, which was also attended by a very large number of residents. The council obtained authorization and could go ahead with applying for municipal status. The parliamentary assembly granted the mayor his request and, on February 6, 1958, Rosemère was officially given the status of a town. At that time, the population had reached the 5,500 mark. In December 1975, the Municipal Housing Board was formed. Its main function is to manage the Terraces Rosemère, a home for senior citizens. The provincial government and the Town of Rosemère are jointly absorbing the home’s annual deficit. 1975 was also the year when a special by-law was passed, authorizing a loan for a new city hall. The old premises on Philippe Street had become too small and could no longer meet the needs of a fast-growing community. On October 16, 1977, the new City Hall at 100 Charbonneau Street was officially inaugurated. Between 1974 and 1976, when the Mille-Îles River had swelled to a record high, Rosemère pulled down all riverside homes built on stilts for the construction of new dams to protect homes from springtime flooding. In 1983 water levels once more rose as high as in 1974, but the dams prevented any further damage done to properties. The new Community Centre opened its doors on February 18, 1979. The municipal library permanently moved in the Centre, after multiple moves since it was first founded by a group of volunteers in 1946. During the eighties, development of residential areas and quality of the environment became priority issues. From 1981 to 1986, the population grew by 11.5 percent, and in the five years that followed, from 1986 to 1991, the population soared by an impressive 31.6 percent to 11,416. With an ever-growing population, municipal services were expanded and several volunteer organizations sprang up. Thanks to the efforts of one of these volunteer groups, the Rosemère Arena was built. 1990 was marked by the creation of a permanent environment committee formed by ordinary citizens, specialists and elected municipal officials. That same year, Rosemère’s country-like character was officially recognized. In fact, Rosemère won first prize in two provincial contests, Ville verte and Ville fleurie. The city also proposed a large-scale park and green space development project. New by-laws were adopted with the aim of improving the protection of the environment. Rosemère was one of the first communities to control the use of pesticides. Environment-oriented initiatives such as composting, recovery, recycling and others were implemented in partnership with the Société d’écologie de Rosemère. Over the years, Rosemère naturally became a greener place to live, thus intensifying its warm and welcoming country-like charm. In the early 2000s, Rosemère had little more than 13,000 citizens. Its development was almost complete, with more or less than 700 lots to build. It now looked to improve the built heritage. Today, Rosemère has more than 14,000 citizens. We now look to improve the built heritage. Rosemère also seeks to consolidate its position as a leader in environmental matters. It also pursues its commitment to various programmes such as "One birth, one tree", "Rosemère in Bloom" and the "Secret Gardens Tour". Its actions and their results incite other municipalities in the Thérèse-De Blainville RCM to follow in its footsteps with harmonized avant-garde by-laws prohibiting the use of pesticides for aesthetic purposes. This has led to increased awareness, among citizens, of more natural gardening methods. To live in Rosemère is to live in "A Town in Harmony". English adaptation of the original French text drawn from Rosemère – Hier et aujourd’hui (Rosemère — Then and Now). Brochure written by France Lapierre and Jack Rice and published by the Rosemère Community Services Department in 1983 to commemorate the 35th anniversary of the Town of Rosemère.